Empire so often flies by the seat of its True Religions, it feels like a chain story written by a group of people who aren’t in the same room, and who have mild, friendly rivalries against one another. This is an intractable problem for a television show to have, because the good episodes bear out the theory every bit as much as the terrible ones do. The ironically titled “My Bad Parts” is easily the best episode of Empire’s tumbledown second season, and it seems to come out of nowhere. It’s not the kind of surprisingly enjoyable episode that acquits the choices that came before it, it just seems like the chain got an especially shiny link added to it by someone who grasps what the show is supposed to look like in a way his colleagues don’t. The episode was penned by Malcolm Spellman, whose last credit was on season one’s “Dangerous Bonds,” an episode just as lovably messy as “My Bad Parts.” And for Empire, lovably messy is the sweet spot, as opposed to the just-plain-messy majority of the season. Sure, there are imperfections, and not much of the episode flows naturally from the events of “True Love Never.” Lucious was last seen exorcising his demons in a studio session with Freda Gatz, then suddenly he’s using Freda as his bruiser in a needless escalation of his war with Hakeem. Hakeem and Jamal have gone from bitter rivals to snack buddies and I have no memory of their reconciliation. Lucious is still having arbitrary flashbacks to his traumatic childhood even now that the timeline has extended beyond his mother’s suicide, the event I hoped marked the end of sepia-toned shots for a while. But considering how much of a disappointment the season has been, it’s important to appreciate what’s present rather than lamenting what’s absent. And there’s quite a lot to appreciate here, including a decent amount of logic, sound storytelling fundamentals, good music, and a well-deployed, well-cast, and competent guest star. Even better, “My Bad Parts” is rooted in hip hop culture, an aspect of Empire that frequently gets muddled in the interest of whatever random direction the writers want to take the story. Again, it’s imperfect. I’m pretty sure MCs don’t prepare for battles as if they were primary debates, or hold them in spaces that look like sets from Gorgeous Ladies Of Wrestling. And I’m not sure in what galaxy Hakeem won said battle, because according to my score card, Freda Gatz ethered that dude and rode his hoverboard back to Brownsville. 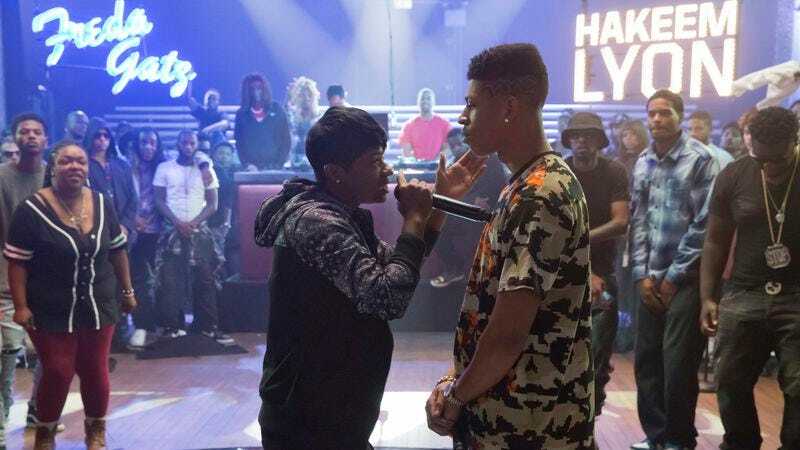 However, in the same fictional world in which Jamal sang his way out of a rap battle and Lucious is Tupac and Diddy rolled into one, the face-off between Hakeem and Freda is as authentic as it gets. A relatively authentic rap battle is exactly what Empire needs because rap battles, while almost exclusively about ego, are fueled by genuine animus. 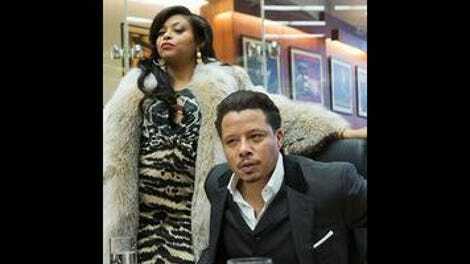 There’s plenty of ego in Lucious and Cookie’s rivalry but neither act as though their professional reputations and millions of dollars are at stake. They act like garden-variety squabbling spouses, and their arguments about label business could just as easily be about shared custody of a toddler. That’s why of the two instances of Lucious and Cookie using their sons as proxies in their ongoing military campaign, one feels consequential while the other one doesn’t. Hakeem’s story is the important one for once, which is interesting given how superfluous he occasionally felt in season one. Here, he’s trusted with the future of Lyon Dynasty and gets the opportunity to score a win for his new company and flick off his father in one fell swoop. Jamal, who started out the season looking like the most important character outside of the leads, has the Lucious-Cookie grudge match that feels inert and unimportant. Jamal gets a shot at a sponsorship deal with Pepsi, but can’t decide whether to pitch them on a song he’s written with Cookie, or another produced by Lucious. Most of the story falls flat because the mechanics of music production and record deals are so inscrutable on Empire, there aren’t inherent stakes to Lucious finding out Jamal is working with Cookie. The issue with a fictional music business in which artists can defect with impunity is that just as soon as someone switch sides, they can switch right back, as has happened dozens of times already. Does it even matter which label the boys’ records come out on? Forget Swiftstream, let’s get cracking on this Empire-Lyon Dynasty merger so we can stop pretending there’s a practical distinction between the two. All that said, the idea of mashing Cookie’s and Lucious’ songs together is a pretty cool one that yields one of the season’s few musical sure shots. I’m not sure how we arrived here, seeing as I’ve literally never seen or heard Cookie involve herself in the production end in such a hands-on way. But that’s forgivable if only because for once, Empire depicts the discipline of music production as something other than dispensing recycled pop psychology when someone is singing at slightly less than their full capability. It’s not a to-scale simulacrum of the modern music business, but it’s also not a baffling funhouse-mirror version (see: Apex Satellite Radio, “jack your track”), and for Empire, that’s kind of a big deal. It’s also a big deal that Rhonda and Anika appear in the same episode, and even in the same scene. After weeks of utter uselessness, Anika proves her worth by getting pregnant and letting her crazy hormones lead her to pose as a driver so she can do something or other with Laura, the latest object of Hakeem’s affection. Who even knows what that cliffhanger means, other than that Laura is in some kind of danger because Anika wants to use her pregnancy to weasel her way back into Empire. Laura and the baby are totally unrelated, and I doubt Anika would actively do anything to harm Laura since she’s barely viable as a character as it is, and certainly doesn’t need to do anything to piss the audience off. But Laura is definitely at risk because Anika is aggressively terrible at everything she does, so she’s probably a reckless driver. Buckle up, indeed. Sure, it’s a bit of a narrative non-sequitur, but when it’s delivered with the goofy, giddy punch of a bewigged Anika behind the wheel, all is forgiven. I don’t understand the wisdom of initiating the battle from Lucious’ perspective, and the bet doesn’t make a ton of sense. What’s so enticing about the prospect of releasing a record by Hakeem after Freda Gatz has publicly embarrassed him? Laura’s a virgin! That’s cute. Funkmaster Flex appears as the DJ at the battle, and he drops Easy Mo Bee’s classic “Flava In Ya Ear” beat, which is a nice touch. Not that I miss Michael or anything, but I didn’t expect him to be missing in action for quite this long after the Chase One Incident. The Swiftstream deal went through, though not nearly with the terms Lucious would have liked.